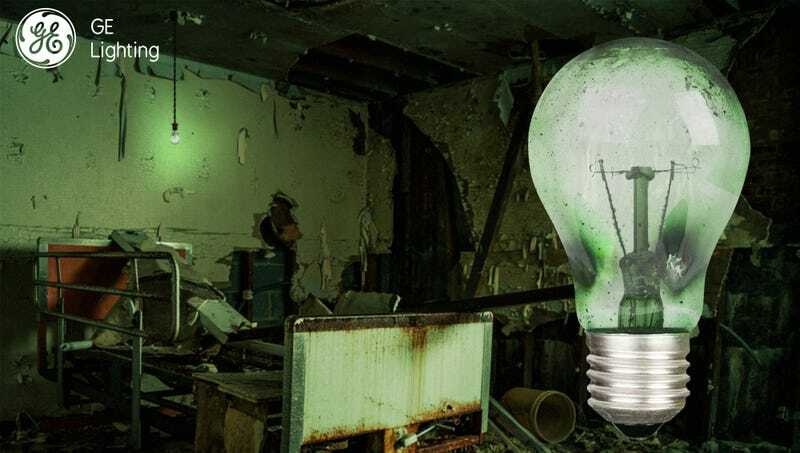 BOSTON—Responding to the needs of thousands of long-deserted psychiatric facilities, condemned terminal-disease hospitals, and abandoned pre-war orphanages across the nation, General Electric has released a new line of flickering light bulbs for abandoned sanatoriums. “Installed thoughtfully at the sudden dead-end of a decaying corridor or swinging spasmodically over a cobweb-cloaked electric chair, our new Asylum™ bulbs will partially illuminate your decrepit medical facility with 10 times the eerie irregularity of ordinary incandescents,” a GE press release said of the line, which will be offered in Hypoxia Blue, Tubercular Yellow, and Revealing White, all of which will gutter, spark, and emit an almost painfully bright glare for one paralyzing moment before plunging customers into total darkness. “From the peeling-plaster dim of the solitary confinement annex to the half-glimpsed scuttling inpatient chambers, Asylum™ bulbs cast the perfect erratic light for any room in which a moldering wheelchair faces the corner and inexplicably rocks back and forth.” General Electric has confirmed that the bulbs will only be offered in 10 watts, ensuring that occupants of any given shadowy room will remain uncertain as to exactly where that breathing is coming from.